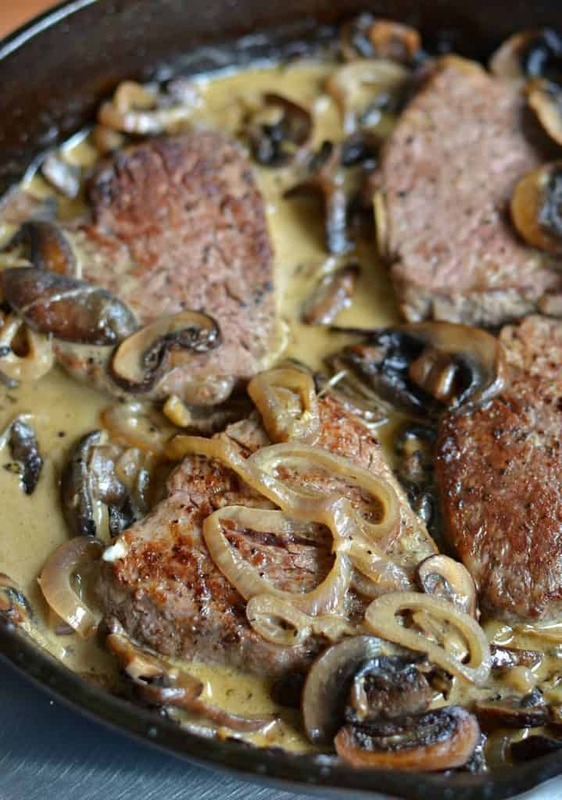 Steak Diane is beef tenderloin, mushrooms and shallots in a sauce made with seasoned pan juices, brandy, cream and a touch of mustard. Skip the expensive restaurants and make this mouthwatering dish right in your own kitchen. 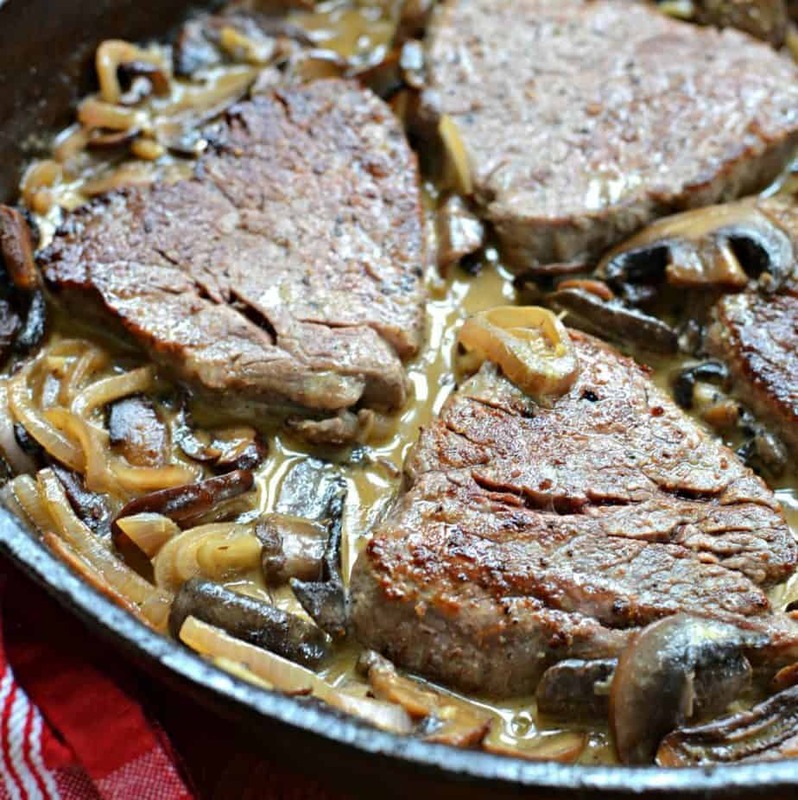 Steak Diane is one of my absolute favorite steak recipes. I usually wait for tenderloin to go on sale and it always does eventually. Then I grab my shrooms, shallots and cream and I am armed and ready to make a mouthwatering quick skillet recipe for my family. This outstanding steak recipe is made in one pan in about ten to fifteen minutes. 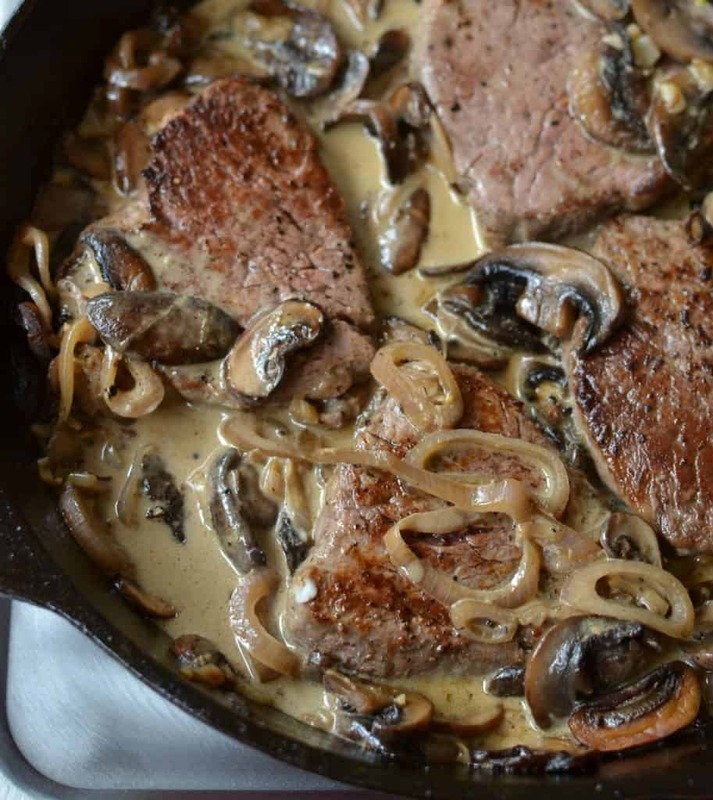 Steak Diane is beef steak (usually tenderloin) cooked in butter and served with a delicious sauce made from the pan juices, brandy, beef broth, cream, and a touch of mustard and Worcestershire sauce usually accompanied by skillet browned mushrooms, shallots and garlic. The steak is most commonly flambeed with brandy but with this recipe I just deglaze the pan with the brandy and reduce the brandy before preparing the sauce. What are the best cuts of beef to use for Steak Diane? By far the best cut of beef to use is tenderloin medallions also know as filet mignon. However you can use flank steak or petite shoulder. Honestly you can use any tender cut of beef that can be cut into 3/4 inch thick slices and seared in butter in a skillet. How do you prepare Steak Diane? Melt butter in skillet over medium heat. Cook steak until golden brown on both sides. Remove steak to plate and melt a little more butter, add mushrooms and cook until golden brown. Add shallots and cook 1-2 minutes then add garlic and cook for 30 seconds. Turn off heat and add brandy. Return heat to medium and scraping the bottom of the pan deglaze it and reduce the brandy by half. Then add the beef broth, cream, Worcestershire sauce and mustard. Finally salt and pepper to taste and return the medallions back to the skillet. Garnish with fresh parsley and serve. This steak recipe is simply amazing and easily prepared by even the novice chef. So put this delicious recipe on your to try list and start keeping an eye open for tenderloin to go on sale. Other Steak Recipes you will love! 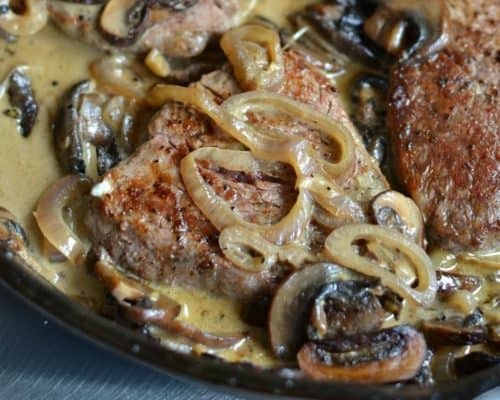 Steak Diane is beef tenderloin, mushrooms and shallots in a sauce made with seasoned pan juices, brandy, cream and a touch of mustard. Lightly salt and pepper the tenderloins. In skillet over medium heat melt 2 tablespoons of butter. Add steak and brown well on both sides. Remove steak to plate. Turn heat to medium high and add remaining butter and olive oil to skillet. Add mushrooms and spread them out so that as many as possible are exposed to the heat. Cook until they start to turn golden brown stirring a couple of times. Add shallots and cook another 2 minutes; stirring a couple of times. Reduce heat to medium low. Add garlic and cook for 30 seconds; stirring continuously. Remove from heat and add brandy. Return to heat and continue cooking until reduced by half. Whisk in the cream, Worcestershire Sauce and mustard; cooking for 1-2 minutes. Whisk in the beef broth and salt & pepper to taste. Return beef to the pan and heat for 1-2 minutes. Sprinkle with parsley and serve.